Allison is a Robotic Total Station Superintendent at McKinstry and loves solving problems. She plays a key role linking construction sites with her office through advanced technology. Her skills in math and her keen eye for accuracy helps ensure that buildings will stay standing for years to come. "People have said that women aren’t strong enough to work in construction but that’s just not true. We just have to think about solving those problems in a different way." 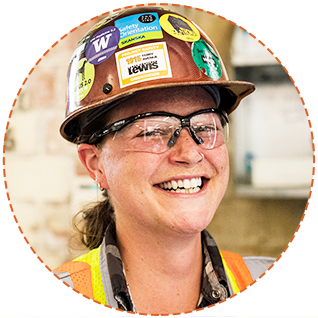 Allison found that she really loved construction when she realized the math she learned in high school could be applied to the construction world.